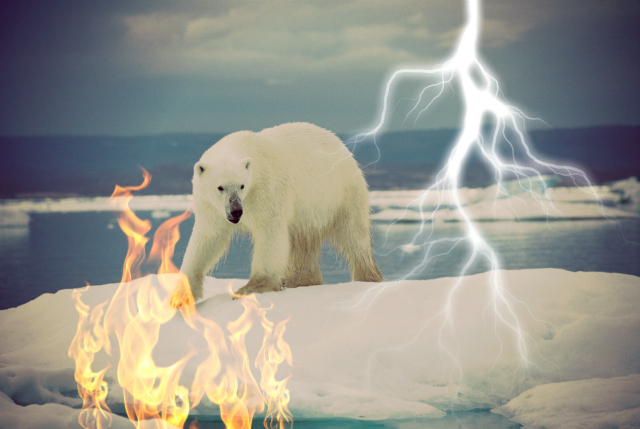 The National Oceanic and Atmospheric Administration (NOAA) published its seventh-annual Arctic Report Card this week, and though they didn’t hand out a grade as they have in the past, it might as well be marked “G” for grim. Here are six of the biggest problems up north. 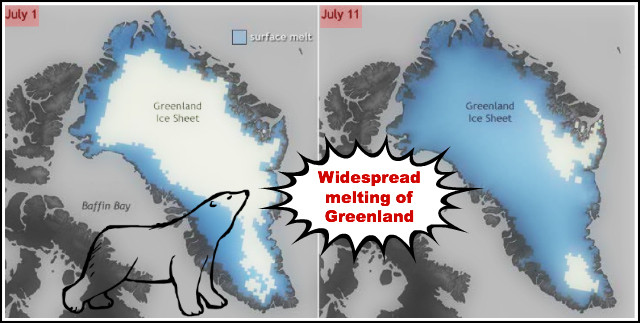 Virtually the entire length and width of the surface of the Greenland ice sheet melted for the first time in 2012. This year was also the longest melt season ever witnessed. Plus Greenland’s ice lost some of its glitter as exposed soot, dust, and other particles blew onto the snow, darkening it and making it even more susceptible to melt. The more Greenland melts the more sea level rises. 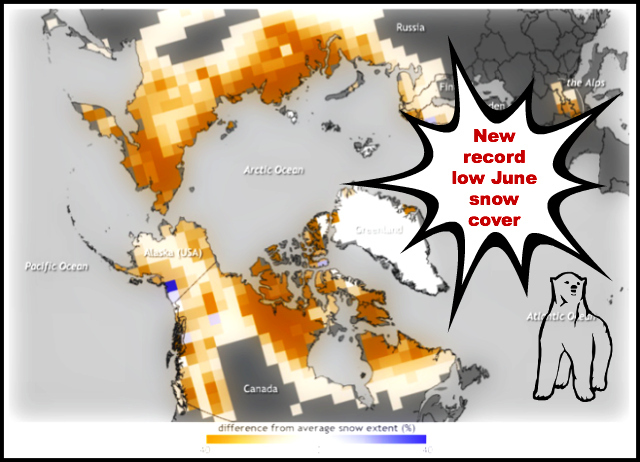 Snow cover extent in both Eurasia and North America hit new record lows in June—the third time in five years that North America has set a new record low and the fifth year in a row that Eurasia has. The rate of June snow cover loss over Northern Hemisphere lands between 1979 and 2012 is -17.6 percent per decade—a faster decline than sea ice loss. Loss of spring snow cover affects the length of the growing season, the timing and dynamics of spring river runoff, permafrost thawing, and the yearly breeding and migratory clocks of wildlife. These schedule changes can throw species wildly out of sync with their environment—animals might migrate after their forage food has passed peak nutrition, for example—threatening their survival. 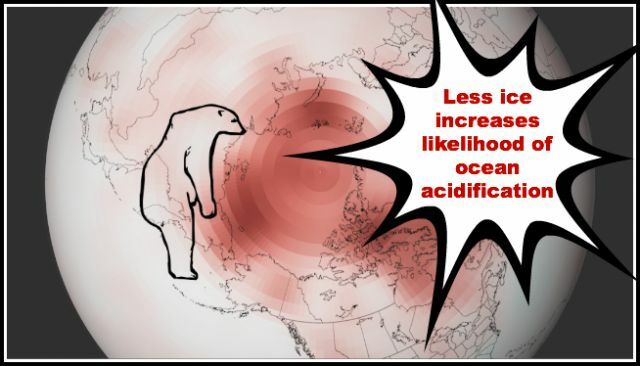 Arctic sea ice reached its smallest coverage, or extent, on record, 18 percent smaller than the previous record low set only five years ago and 49 percent below the 1979-2000 average. As the ice pack shrinks the ocean absorbs more sunlight and warming accelerates causing even more ice loss. Consequently wind patterns, clouds, ocean currents, and ecosystems are undergoing rapid transformations. Arctic sea ice used to persist for many years, getting older and thicker with each passing year. Nowadays, not only is the area or extent of sea ice dwindling, but its volume too. The loss of old, thick, melt-resistant ice can easily become a self-reinforcing process. When old ice melts away—or when young ice fails to survive melt seasons—the ice that remains in the Arctic is predisposed to melt quickly the following summer. And that’s what’s happening in the 21st century, as you can see in the animation showing ice volume from 1987 to 2012 (below). 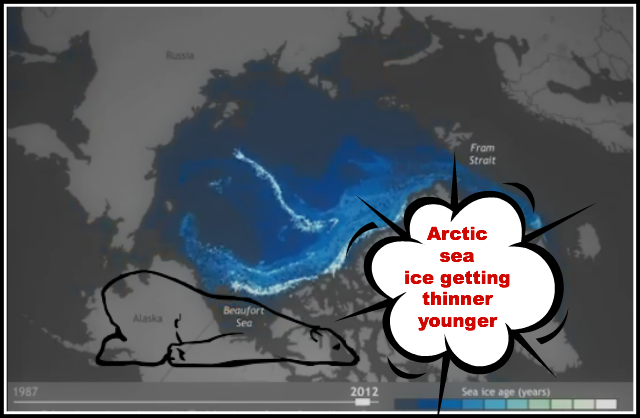 Watch how old sea ice, on which so much Arctic life depends, is fast disappearing. 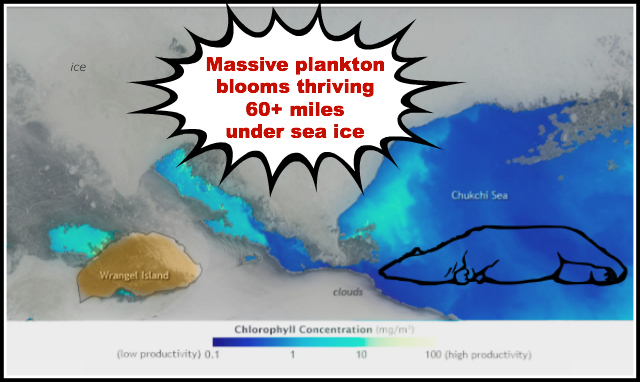 High primary productivity created by blooms of phytoplankton are normal at the edge of sea ice. But when this image was captured scientists at sea discovered a massive bloom reaching up to 62 miles / 100 kilometers under the thinning ice—yet another change in yet another Arctic ecosystem. The loss of the polar ice cap over the Arctic Ocean exposes the waters to rising levels of atmospheric carbon dioxide like never before. No one yet knows what scary changes will ripple out from that. All background maps and data visualizations courtesy of the NOAA climate.gov team. See originals and more here. All graphic mashups: Julia Whitty.